An 80th birthday is a very special birthday. It deserves to be celebrated, and it deserves a special kind of celebration. 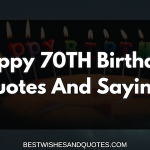 If you know someone who’s celebrating their 80th birthday, it’s an opportunity for you to say what’s in your heart and to wish them a very special wish that they will surely treasure. 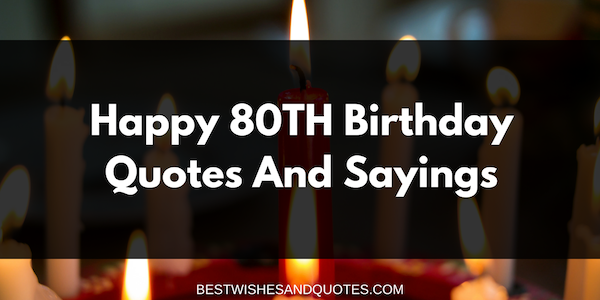 Here are some examples of heartwarming Happy 80th Birthday quotes and sayings that are perfect for the occasion. It’s such a blessing that I’m greeting you a very happy 80th birthday, Mom. Life has been good to you, and the years have been very gracious. My heart is filled with gratitude because you are strong in body and sharp in mind. I love you very much, and I wish you many more birthdays to come. Enjoy this day to the fullest. If I only had one wish for you, I wish that God will bless you with many more beautiful years with all of us who love you. You are so loved, Mom. You are only getting better with age. I love you so much and I hope you have the most unforgettable 80th birthday! Hi, Dad. Happy 80th birthday! It’s wonderful to see you looking so happy and healthy and ready to party the night away. Thank you for being so good to me and for putting our family first in everything that you do. Thank you for all the sacrifices that you have made over the years. There wouldn’t be me if not for you. I love you. To the best dad in the whole world, happy 80th birthday. I hope that when you look back on all the years that have passed, your heart will only be filled with love, peace, and joy. I hope that your memories are all beautiful and happy. I love you so much, Dad. I wish you nothing but the best today and always. We are celebrating the best dad in the world today. Happy 80th birthday, Dad. I hope that your heart is filled with love and joy. I hope you can forgive me for all the heartaches that I have caused you when I was younger. I still feel bad about hurting you back then. God bless your heart, Dad. I love you very much. I have wished all wishes that will make you happy and fulfilled. Now I wish that whatever wish that has remained unfulfilled over the years will finally come true for you. I love you so much, Dad. I am very proud to be your son. Happy 80th birthday. Every day is a gift from God. This special day is an extra special gift because it makes you 80 years old today. I wish you everything that you been wishing for in this world. I love you, Mom. Happy 80th birthday. I consider it a miracle to celebrate your 80th birthday today, Mom. A lot has happened in the last few years. I am so grateful for this day because you are here with us to celebrate a milestone. I love you so much, Mom. May you be blessed with more years of life. Happy 80th birthday! I am so grateful that we have many wonderful memories to share. Being your daughter is truly a blessing. I have learned so much about life and love because of you. Thank you for being such a beautiful, brilliant, and brave mother. Happy 80th birthday! Happy 80th birthday to my mom who will be forever young. You’re another year older but you have looked the same for the past 15 years. You are still fascinating and beautiful. I love you so much, Mom! I hope you have the best day! Hi Mom, may your 80th birthday be filled with lots of love and laughter and many magical moments. God bless you with more years and more life. I love you, Mom! Thank you for everything. You truly make this world a better place to live in, and you have been doing it for the past fifty something years! It’s truly incredible. I love you, Mom! Take it easy now because you deserve to relax and enjoy. Happy 80th birthday! Thank you, Dad, for giving me some of the most amazing moments and experiences in my life. I will never forget them. I count myself truly blessed for having such a great father like you who has been with me every step of the way. I wish you a very happy 80th birthday. I love you very much! When I first met you, I have to admit that I was intimidated. Here was a woman who was so sophisticated, glamorous, beautiful, and smart. I was so sure that it would take me years before I ever had a close relationship with you, if at all. But you welcomed me into your life like your own daughter. You are the sweetest, kindest, most loving, and most supportive mother-in-law. Thank you for all that you have done for us all these years. I am so blessed to have you as my second mom. Happy 80th birthday! Thank you for raising a son who’s only the best man I have ever known. He’s such a good and loving man, and he could only have gotten this from his parents. You have been so kind and loving to me all these years that I truly feel like part of the family. Thank you for your guidance and support, Mom! Happy 80th birthday! I don’t have a lot of female influences in my life. My mom passed on when I was a young kid and I didn’t have any aunts or godmothers, either. When I met you, I finally met someone I could love like my own mother. Thank you for everything. I love you and I wish a very happy 80th birthday. To the best father-in-law in the world, happy 80th birthday. You are a great and admirable man, and I know that you love your daughter very much. I promise to take care of her and love her for as long as I’m living. You can count on that. Thank you for everything, Dad, and God bless you more. May your 80th birthday make you realize just how much you are loved, cherished, admired, and respected. Have the most amazing day to the most amazing father-in-law in the world. Happy 80th birthday! I hope that the sun will shine brightly today on your birthday the same way that your love has shone for all the people in your life. Happiest 80th birthday to my dearest father-in-law! Thank you so much for your guidance, generosity, and love through the years. On your 80th birthday, I wish you more love, life, and laughter. May you have more birthdays to come, and may blessings continue to be showered upon you. Happy 80th birthday! You are more than just my mother-in-law. You are also my friend, my mentor, my teacher, and my second mom. Thank you for giving me the love that mothers can only give to their daughters. Happy 80th birthday and I wish you all the very best. I am very blessed to have not one but two amazing mothers in my life. Thank you for always being kind and generous to me. I love you and I wish you all the best in this world. Stay happy and healthy. Happy 80th birthday to the best mother-in-law! There are so many things that I’m grateful for in my life. One of them is having you for my father-in-law. You are truly an angel here on earth, and you deserve all the blessings that you continuously receive in your life. May God continue to bless you and keep you safe from harm. Happy 80th birthday! You are celebrating another birthday, my love. I thank God for this wonderful blessing and for giving us another year to be with each other. I love you and I look forward to creating brand new memories with you this year. Happy 80th birthday, my love. We have been celebrating our birthdays together for as long as I can remember. Thank you for being with me all these years. I love you and I always will. Here’s to your wonderful 80th birthday. The years have been very wonderful to us. There’s nothing else that I could ask for because I have everything I could ever want right here with me. Happy 80th birthday, my love. To be perfectly honest, I stopped counting my age when I turned fifty. They say that it’s your 80th birthday today. Thank you, God, for the gift of life. Thank you, God, for blessing my dearest husband with another year. I pray that you will always be good and strong. Happy birthday, my sweetheart. To the love of my life, my muse, my best friend, and my dearest wife, a very happy 80th birthday. I thank God that we have been blessed with another year to love each other. Thank you for this beautiful life that we have and our beautiful children. I love you and I always will. It has been such a wonderful life! Thank you for helping me create it and for giving me the most beautiful moments and memories. I pray that we will be blessed with more years of life and love. God bless you more, my love. Happy, happy 80th birthday. It has been the joy of my life to call you my husband, to raise our children with you, and to grow old with you. I could not ask for anything more because God gave me the most wonderful husband already. My life is beautiful because of you. Happy 80th birthday. I am very blessed to have you as my wife. Thank you for never leaving. You are my heart. I am the luckiest and richest man in the world because of you. Happiest 80th birthday, my love. I wish you a very happy 80th birthday, dearest auntie. I pray that you will always be strong and healthy, and that you will always be safe wherever you may go. Thank you for being so kind and generous to me, and for treating me with love and respect. I love you! On your 80th birthday, I wish you all the best in this world. I wish for your good health and strong mind. I wish that all your wishes will come true. Stay happy and blessed. I love you so much! Happy birthday! You are someone that I will always look up to. I know how much you helped Mom in raising me, and I will forever be grateful for you. God bless you more, dearest Auntie. I pray that God will continue to work wonderful miracles in your life. A very happy 80th birthday to you! Sometimes I forget that you may also get lonely once in a while, especially whenever I can’t visit. I want to apologize for not being around as often. I will make it up to you, Uncle. Today let me celebrate the wonderful man, the good husband, the great father, and the incredible uncle that you are. Happy 80th birthday! God bless you. Thank you for being one of the strong male influences in my life while I was growing up. I am lucky to have a very close-knit family and got to spend a lot of time with you when I was a kid. You are still the kind, generous, supportive, and brave uncle that I know. I’m always praying for you. Stay happy and strong. Happy 80th birthday! Some of the best moments I had when I was a kid were spent with you. I will never forget your kindness, your love, and your concern. Thank you for being such a great aunt. I love you very much. Happy 80th birthday. 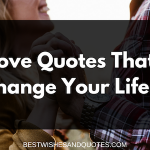 These are just some examples that you can send to that special person in your life who’s celebrating 80 wonderful years of life. Let your gift of words make them feel how much they are truly loved and cherished!